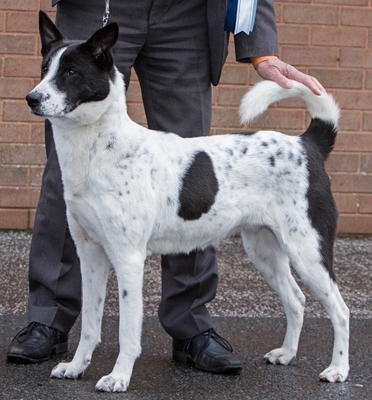 Anacan Canaan Dogs - breeder, UK, Minto, information, photos, news Anacan Canaan Dogs - breeder, UK, Minto, information, photos, news. Click on photo to enter our site! This site will tell you all about the beautiful Canaan Dogs of Anacan and a bit about their owners, Richard and Ellen Minto. Ellen has been involved with Canaan Dogs since 1984 and Richard since 1990. Ellen plans the breedings and Richard helps with the care, training and exhibiting of the dogs. Because of their love for the breed, they have worked hard to help promote and preserve the Canaan as the natural dog it is, and to help others who wish to get a good start in the breed. One of their greatest joys is sharing what they have learned about Canaans with whomever will listen. These pages give a brief history of the Canaan Dog, which is a middle-Eastern pariah dog and the national dog of Israel. Canaans can still be found in the wild and around Bedouin camps, and from time-to-time some of these dogs are added to the genepool by the Israelis under a system called 'miun' (literally 'sorting') to help keep the breed healthy and benefit the breed worldwide. This site also contains general breed information, answers to frequently asked questions, availability of puppies, photos and write-ups on each of our dogs, breed note column archives, which Ellen wrote for Dog World until it went into administration, as well as links to other Canaan Dog sites. Ellen also lets you in on their plans and news of what the Anacan dogs are doing. Now go back and click on the photo to view the Table of Contents.